Yet another 200 Great British Pounds were handed out this week as part of January's Monthly Prize draw. Winners invest as little as £1 each month for a share which helps to support the club's running costs yet creates cash prizes such as those on currently on offer. The more participants the bigger the cash prize pot can grow. The uninspiring weather conditions over the last two months have caused havoc with the fixture schedule. This not only frustrates players, fans and officials alike but it causes concern for the club's financial obligations when home matches are postponed and converted into midweek matches. Nevertheless, one thing the weather can't influence and that's the Monthly Cash Prize Draw. So, get involved and don't miss out February - there's still time. Fill out our online form here and in one swift move you are halfway there to supporting a national institution that is Corinthian-Casuals Football Club. 05.02.14 Corinthian-Casuals supports "It's a Penalty"
As Corinthian-Casuals has great following in Brazil Secretary, Gary Weir, sees a real opportunity to help spread the message to fans both in England and Brazil. "Corinthian-Casuals is unique not just in Non-league but throughout the football league. Our online following from Brazilians on Facebook makes us the 25th most followed club in England on this platform", commented Gary. He continues, "We have an unrivalled reach due to our historic link with Corinthians Paulista and immediately identified the need to support Happy Child's "It's a Penalty" campaign to raise awareness". What do you think of this initiative? Why not comment on this article on our blog here. The last three months cash prize winners were drawn on Tuesday evening. 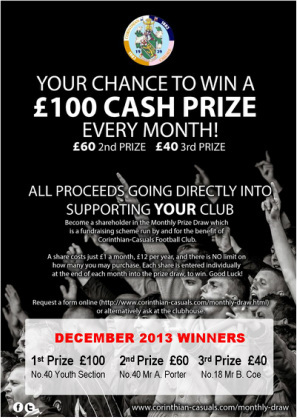 The Monthly Prize Draw is a club fundraising scheme which provides up to £200 worth of cash prizes. The more participants the bigger the cash prize! And, it only costs £1 per share, per month. Look no further and get involved. For more information and to obtain an application form head over to our Monthly Draw page here. 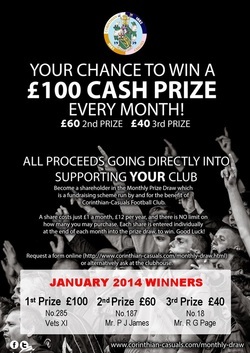 Alternatively, request a form behind the club house bar this Tuesday and get involved in January's draw. Christmas came early for five lucky winners on Saturday as the annual X-mas cash draw and the first ever online natal loto took place at King George's Field. A total sum of £700 was up for grabs as well as the opportunity to win the ultimate must have retro shirt in world football today, the 1910 Brazil Tour Replica in a filmed draw. The 1910 replica was named as such as this was the shirt that started it all. Corinthian Football Club toured the world in the early days and inspired not just new teams but nations too who embraced the beautiful game after the club's visits to South Africa, United States, Germany, Belgium, France and finally Brazil to name just a few. The winners and their ticket numbers of the cash draw are shown at the foot of the article. Many thanks to all those who participated in both draws and for working so hard to raise funds for the club. Special thanks to Corinthian-Casuals legend Tony Slade for organising the cash draw and Club Chairman Brian Vandervilt for distribution of tickets and drawing the lucky winners. Also, thanks to Stuart Tree, Chris Watney and Club Secretary Gary Weir for the management and online promotion of the 1910 Brazil Tour replica. Congratulations to the winners, festive greetings to you all. Alexandre de oliviera won the 1910 Brazil Tour Replica. See the video of the draw here. I am writing on behalf of Corinthian-Casuals Football Club in London to send heartfelt sympathies to all of you at Corinthians Paulista after the tragic accident at your Corinthians Arena. Following our two visits to Brazil in 1988 and 2001 and the continuing contact with so many of your supporters - both coming to our ground in London and in ever increasing numbers on Facebook - we are very conscious of the strong links between our two clubs and can readily imagine the impact of the accident. We would like to send warm support from all of us at Corinthian-Casuals at this difficult time and in particular to offer condolences to the familes of the two workers who were killed. On Saturday before our home league match we will be observing a minute's silence to honour those who died and to add our thoughts and prayers for you all. In the meantime please accept our respects, warm wishes and regards from all of us at the club. In glory or sadness, we stand beside you. An away 2-0 defeat at the hands of Ryman Division 1 North side Thurrock Football Club ensured Corinthian-Casuals now remain focused on the relegation battle already threatening the club. Although possession was very much equal on the day Thurrock FC capatilised on their few chances but Casuals will be hopeful with the effort put in by star players such as James Cottee, Dave Hodges, Ellis Wilson-Joseph and captain Jason Turley whilst noting a record number of shots on goal in comparison to any other match this season. The lost £2,500 cash windfall for qualifying for the next round will come as a blow but as heard on the coach back to Tolworth, "we'll dig out of this" and we'll fight to last breath as per the Corinthian Spirit. 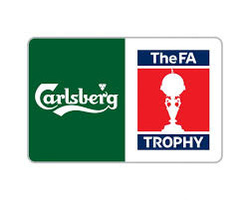 There will be no match on Tuesday as Herne Bay FC will be replaying their FA Tropy tie therefore we will have a full week to wait for victory as we defend three home points. 02.10.13 - Rise to the top of your game! Now in its second year in association with Corinthian-Casuals Football Club Glenthorne High School are looking for new young players for the upcoming academic year. Coached three times a week by elite UEFA A First Level License Holder Barry Wilde, this is a marvellous opportunity for any youngster to attend a trial and start the road to becoming the best! 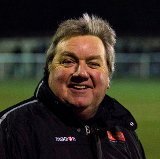 The academy adheres to the Corinthian values of playing football the proper way and there is no better person to be coached by than Barry Wilde and his assistant Kenny Bremner, a full UEFA A License holder. It was Legends day at King George's Arena as the club's record goalscorers and record appearance holders were back on the hallowed turf again to see out a three way tournament. Event organiser Roger Steer convinced the old boys out of retirement and showing true corinthian spirit by walked out on the pitch and gave it their best shot. The event also brought out the family with a bouncy castle for kids and old friends were reunited in the patio. The reunion was further celebrated at the end with drinks and a delicious buffet whilst reiminscing of the tours of Japan and Brazil. Thanks to all for organising this successful event which must be repeated. 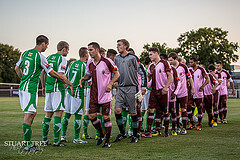 Matchday photos by Chief Club Photographer Stuart tree are available here and If you are an ex-Corinthian-Casuals player and you are interested in playing for the schools touring XI side please get in touch with Brian Wakefield on 07979 5524 036. The London Football Association invited Corinthian-Casuals to attend the 8th annual awards evening at Crystal Palace Football Club. Curious as to why we had an invite was unclear until the chairman and last year's club secretary was awarded with Club Administrator of the Year. This well deserved achievement was presented by Vicky Pickard of the London FA and represents the passion the Chairman brings into the club. He has put in countless hours to ensure the club plays football every week and has even toyed with danger as the person responsible to replace dud floolight bulbs. There are an estimated 400,000 active volunteers in this country contributing to a wide range of activities. 53% of these are in the sports industry. Clearly this makes voluntary support of sport and Corinthian-Casuals vital. Our club has a number of exciting opportunites available such as assistant treasurer, reporters, photographers and digital art and design. If you feel you have something to contribute or even gain experience in go to our recruitment page to view our current vacancies. A pleasing away performance at the Southwood Stadium allowed the Casuals to take a point back to Tolworth. With an increased number of chances in comparison to previous matches witnessed this season the team will have been disappointed not to have taken all three points. Byatt opened the scoring after 64 minutes picking up a stray pass on the edge of the box and ramming home the opener. However, it didn't take long for Ramsgate to equalise. After a lapse of concentration in the Corinth defence, a deep inswinging corner was met with a free header at the back post to bring the score level. Although it finished 1-1 had the Casuals capitalised on a number of chances it would have been a deserved victory, nevertheless it wasn't to be. Elsewhere, Paul Stewart's reserves picked up three valuable points in the Suburban Football League winning 3-2 at King George's Arena against Richmond & Hampton Borough. The Schools touring XI meanwhile handed out a lesson to the students of Winchester College winning the match by 5 goals to their 1. Marques, an ex-pupil at St.Bernard's, grabbed a hat-trick in his first game for the club. Two of the three senior sides travel away this weekend. The first team are away on Ryman league duty playing Ramsgate on the Kent coast with the coach leaving Roebuck Road at 11:30am. General Manager and Interim 1st team boss Brian Adamson will be hoping to secure the three points that are up for grabs and start a good run of form off the back of an excellent team performance in the FA Cup last week. The reserves host Hampton & Richmond Borough in their second league match of the season. Despite the 0-4 home defeat in midweek to a superior Sutton United, played in the first leg of the cup, reserves team manager Paul Stewart and his assistant John Chinnery will need to devise a cunning plan should they want to be victorious against this formidable opponent. Finally, the Schools XI touring side travel to Hampshire in match 5 of a series of exhibition matches throughout the season whose aims are to spread the gospel of the #CorinthianSpirit. To find out more about their opponents, Winchester College, why not check out our schools XI section. 05.09.13 - Who do you want to play in the Corinthians Arena? Support in Brazil for Corinthian-Casuals has probably never been as great as it is today with Corinthians fans claiming that their "father club" should play the inaugural match in Itaquera, the location of the Corinthians Arena in São Paulo. As of today the club's reach on Facebook peaks at 17,902 which is a comfortable midtable 13th position in England's silver category, the Championship. This was thanks to webpage meutimao.com.br, a hugely popular fanzone website with Corinthians supporters, having taken the opportunity to gauge fan's opinion and record the highest number of votes in comparison to any of their other polls. An extraordinary 61% effectively want another Corinthian tour to their homeland and the desire for this occasion to happen is shown each week as we receive welcome visits from the King George's Arena with fans praying for an all Corinthian inaugural affair. We pray your dream comes true! 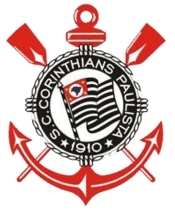 01.09.13 - Happy birthday - parabéns Corinthians! Sport Club Corinthians Paulista celebrates it's birthday today, 103 years since the Corinthian spirit landed on the shores of Brazil, inspiring the formation of a new nation. Corinthian-Casuals FC, have passed on our birthday wishes to the Brazilian club across our social media channels and have been on the receiving end of an array of gratifying messages from the Corinthian nation in Brazil thanking the Corinthian Football Club for having spread the gospel of football during the tour of 1910. Have a look at some of the messages received on your right in our twitter feed, open google translate and understand the passion that unites the people of both clubs. Vai Corinthians e Parabéns! 31.09.13 - Through to the next round. Victory for Corinthian-Casuals todday ensured classification for the next round of the FA Cup with an away fixture against fellow Ryman Division 1 south rivals Merstham FC. After a competitive first half from both teams it didn't take for the Casuals to demonstrate the seriousness of the tie by knicking a goal early on in the second half through Joel Thompson who tapped into empty net after stealing the ball from the keeper out of nowhere. Jamie Byatt's goal on 66 minutes doubled the casuals lead and showed how much victory meant to Byatt and the team after a passionate celebration with the Casuals' fans. Chris Watney cooly finished his effort on 76 minutes after finding himself one on one with the keeper after a nice through pass by midfield ace Jason Turley. The tie was never at any stage in doubt in the second half and emerged just victors of the tie. The club was delighted to host the players and officials of Erith Town and we hope one way or another we meet them again soon. We wish them the best of luck with their season who currently top the Southern Counties East Football League. Play up Corinth! Well played Casuals! Full match report will appear in the fixtures section at the earliest opportunity. It is with great regret Corinthian-Casuals announce the departure of their Manager, Kim Harris. Kim has struggled with health problems over the last year or so and he feels this has lessened his abilities to function fully. With this development his assistant Manager, Tony Davies, has asked to stand down also. We are profoundly grateful for their achievements whilst with us. Former Manager, Brian Adamson, has agreed to step in as temporary Manager for the immediate future. The club welcomed league newcomers Guernsey F.C. to the King George's Arena in this fourth Ryman league fixture of the 2013-14 campaign. The game indeed started with a lion's roar but ended up with a comprehensive and well deserved 2-1 victory for the islanders. Despite a scrappy introduction from both sides it took a lapse of concentration from the Casuals' defence for Guernsey to open the scoring. A second for the away side came just minutes after the second half commenced while Jamie Byatt's powerful header on 57 minutes ensuring a tense finish to the end for both sides. Corinthian-Casuals will be encouraged by the final 15 minutes of the match but a game of football lasts 90 minutes and at the end the best team won on the evening. The Green Lions also place an immediate threat to our long standing claim of being the highest ranked amateur club in the English game and by evidence of their momentum both on and off the pitch this accolade won't take very long to grab. See the full photo gallery here. Full match report by our correspondent Malcolm Parker will be uplodaded soon under on the results page under the seniors tab. 18.08.13 - Won one, Drawn One, Scored One...One team! With just a week since the start of the Ryman league campaign we've picked up four points from a possible nine. Apart from the disappointing defeat against Leatherhead last Wednesday and the no-score draw secured at Eastbourne yeaterday the team is confident going into Tuesday match at home to Ryman League newcomers Guernsey. Encouragingly, the defence has achieved yet another two clean sheets in the opening three matches and all credit goes to the whole team which is one watertight unit. Meanwhile, Guernsey Football Club won their first match of the season away at Herne Bay by just the solitary goal but have disappointingly lost their last two home matches coming second best to Horsham (0-1) and Ramsgate (0-4). Despite those defeats Corinth manager Kim Harris will have his team fully prep'd with the same mentality and focus that the three points are ours to be won. This is the match our season ticket holders have all been waiting for and we look forward to seeing you all there to tame the Green Lion's roar that has intimidated opposition through their successful rise up to the Ryman Division 1 South. Follow the live action on our twitter feed on the right hand side of the page and send us your messages by "tweeting" to @CorinthianCas. Don't forget to find us on Facebook. The club was delighted to offer season tickets to our growing number of followers with Neil Collins (pictured left) picking up season ticket number 001 from Chairman Brian Vandervilt. When the opportunity came he snapped it up straight away. As our Brazilian followers would say "Corinthian is not a club, it's a way of life and a passion". Our season ticket holders were treated to a wonderful opening league campaign performance after a 1-0 victory was secured by a wonder strike from midfielder & new signing Ellis Wilson-Joseph. Season tickets are priced at £140 adults and £70 OAP's & students. Tickets for children are just £50. The ticket also allows entry to watch any home reserve fixture with holders given the opportunity to earn a £5 cashback to spend at the clubhouse or clubshop for any referrals. 10.07.13 - "I'm Staying Away From Bikes After Horror Fall"
Danny Bracken (CCFC Goalkeeper)I’ve been playing a lot of cricket this summer, but one sport I’m never going near again is mountain biking. Back in November 2011, not long after I’d broken into the Corinthian-Casuals team, I had to do a ‘mental toughness’ exercise as part of my sports coaching degree. Basically, it involved the lecturers taking us out on mountain bikes. We were going down this steep hill and he told us to brake just before we got to the bottom. Unfortunately, I hadn’t been on a bike since I was about eight, so I had no idea what I was doing. I braked a little bit too late, collided with a root that ended up being a ramp, and took off over the handle bars. I flew about 15 feet through the air, then came down on my neck and shoulder. I was knocked unconscious and when I came round the paramedics were looking over me. One of them said ‘Where’s the pain?’ and I just said ‘All over the place’. He squeezed my shoulder and said ‘Yeah, that’s definitely broken’. They were also worried about my pelvis and my spine. To make matters worse, they didn’t know how to get me down. They tried to get an air ambulance in but then decided it was too hilly to land it. Eventually, they carried me down in an inflatable stretcher, which was pretty painful. Thankfully, when I got to hospital, the diagnosis was no worse than a heavy concussion and a shattered collarbone. With the pelvis, I think being a goalkeeper really helped because rather than going headfirst, I instinctively twisted to land side on. It was obviously very painful, and I found it difficult to write during my exams. I also missed football because that’s my life. But in the long-run it wasn’t that bad because it was only six months out. They said I could have been killed. Obviously, as a goalkeeper, I was really worried about coming back. You think ‘Do I really want to be diving at someone’s feet?’ But it didn’t affect me at all once I got into the games. Other than wearing a padded shirt, it was like I’d never done it. I probably had the best season I’ve ever played.